Reflections and Ruminations: When we truly live in the present, it helps us keep anxiety away. When we truly live in the present, it helps us keep anxiety away. In the embolism that follows the Lord’s Prayer at our Catholic Eucharistic celebration, we used to say ‘keep us free from all anxiety’. The current translation doesn’t use the word ‘anxiety’, but does ask that the we be ‘safe from all distress’. It certainly is not difficult to see that much of our lives is lived with some form of anxiety or distress. When people come up to me and lament that their lives are filled with anxiety, I often as them why this is so. Quite often, it is revealed that they are worried and anxious about how things will turn out in the future, or how they have been stuck in the past. It could be that a project that they are involved in would face some form of failure, or that a relationship will end, or that the doctor’s result has the potential to show up positive. Parents can face anxieties about how the lives of their children will turn out. As a result, many walk around life with faces downcast and have somehow lost their sparkle that was in the eye when they did not have such anxieties. A lot of our worries can be alleviated if we only take the sound advice to fully live in the present. So much of our anxieties are there because of ‘what if’s’. These may not even materialize. Yet, we live so much in the future and load up these unnecessary worries and fears on ourselves, with the result that we stress ourselves to no end. There is a lot of wisdom in the Zen practice of being present to life. But there are also a whole lot of us who are anxious because we are living in the past as well. These, I fear, are more common than we imagine. People who have unresolved hurts, broken relationships and past injuries afflicting the soul are somehow mired in the past. An unwillingness to let go of these wounds causes one to lose that sparkle now. I always remind the penitents who bring up past hurts that if these were already confessed, then their sins should no longer burden them and that if they are still harbouring fears of not having been forgiven by God, then it means that they are doubtful of God’s mercy given in the Sacrament. A Sacrament is, after all, a sure and certain sign of a reality of God’s grace given to us. Certainly, we may find it hard to forgive ourselves for some serious errors and sins of our past, but fully living in the present has to remind us that it is so necessary to forgive ourselves. I find this to be true especially for those who have had abortions. Just as no parent really ever gets over the death of their children, I believe that it is doubly hard to truly get over the lives of children lost due to abortions. The sacrament of reconciliation, when correctly understood and meaningfully celebrated gives one the ability to live in the present no matter how injured or injurious one’s past had been. This is the true beauty of the sacrament. Some friends of mine who had lived in Switzerland for quite many years had recently come back to Asia to live. They were sharing with me about their experiences of living there. I was surprised to learn that there are some Swiss who, though surrounded and immersed in the land of scenic beauty, clean air and financial abundance, are actually unhappy people. One would think that living in such a place would make one happy most of the time. But apparently, this is not so. These friends of mine shared with me that the one reason this isn’t so is because these Swiss harbour the fear that all this will be taken away one day. This just helped to further strengthen my belief that so much of our anxieties in life will be handled well if we fully live in the present. It’s an old adage that happiness is an inside job. This is true to a very large extent, and it has very much to do with how much one learns to live fully in the present. Discernment helps us to let go of what needs to be let go of, and what concerns of the future we ought to legitimately pray about. If we begin to truly live in the present and appreciate what we have now, perhaps we can begin to find that sparkle in life and return that to our eyes once more. In our Catholic tradition, we have always taught and believed that in the Blessed Sacrament, the Lord is truly present. It is God’s true and real presence that we behold whenever we come before him in Adoration Rooms and Tabernacles throughout the world. I also fully believe that Real Presence requires us to also be really present to God, and that Real Presence needs to meet our real presence as well. To be really present also requires of us to not live too much in the future, nor too entombed in the past. 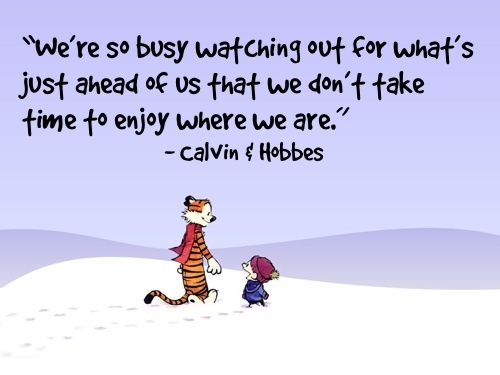 "We're so busy watching out for what's just ahead of us that we don't take time to enjoy where we are." I like the above line. .....something many of us would nod in agreement. Sometimes, I feel it is the little children and poets who hold the secret to living in the present moment! Children have the uncanny ability to live unabashedly in the present moment. Have you ever noticed how un-selfconscious a child is when his body responds to music, rhythm and dance - or how absorbed he is -licking and slurping over his favorite ice-cream cone, savouring every slurp. To relish and luxuriate in whatever one is doing at the present moment is to live that moment to the full.....and when the whole person is attentive to this alone, there will be no room for worry or anxiety. Perhaps, that's why Jesus tells us in (Matthew 18:3) "that unless you change and become like little children, you will never enter the kingdom of heaven.....". That's the Now - where God is! One will never feel his presence, coz one is still lost in the Future and the Past - like you said. Poets too, have this innate ability to live consciously, with alert interest or mindfulness to what's happening within himself and around them. When I read that line above, I recalled with much ease a very simple poem from childhood. Reflecting on it, I see the poet's call to us......to wake up and live the Now!